I feel like everything I share here is going to be my favorite. Sorry, not sorry. This Berry & Dragon Fruit Smoothie Bowl is fruity with a hint of tropical flavor thanks to the coconut flakes and the dragon fruit. It’s my new favorite way to have a smoothie. Have you had dragon fruit before? It’s also called “pitaya”, grows on a cactus-like plant, and tastes kind of like kiwi fruit. It’s fun, amazingly delicious, and full of antioxidants, vitamin C, lipids, several B vitamins, protein, and carotene. Let’s get started! Set all of your toppings to the side so you can prep your smoothie bowl as soon as the smoothie portion is ready (you don’t want it to melt as you look for your toppings). Slice your dragon fruit in half. You can just peel the skin off and cube it. I wanted balls of dragon fruit. However, I lost my melon baller in the move across the world. Go figure. So, I used my teaspoon measure because it’s round. You use it the same way as a melon baller. Just scoop and twist. For the smoothie portion, I used my high-powered Vitamix. We bought it at least 5 years ago and it’s still going strong even though we use it every day. But you can use any blender. First, I added my blueberries. You can use fresh, but I feel like the frozen fruit gives the smoothie more of a thick body. Next I added my mango. In goes the cherries (I ate a few because cherries are amazing). Next were the bananas. These I highly recommend freezing. I usually get a bunch of spotted bananas and break them in half and freeze them for our smoothies. The frozen bananas give your smoothies a creamy quality that normally you’d need some kind of milk to achieve. Also, they naturally sweeten the smoothie so you won’t need sugar. Now blend. You will probably need some kind of liquid to help it along. I used regular water, but you’re more than welcome to use coconut water, juice, etc. Milk (dairy or otherwise) may curdle due to the acids of the fruit. The more liquid you add, the runnier it will be. I added just enough to allow it to blend, but wanted to keep it pretty frosty. Pour blended smoothie into bowl and quickly add your toppings. Toppings are usually (but not limited to): fresh fruit, dried fruit, nuts, seeds, granola, chocolate, grains, etc. I used an apple cinnamon granola because that’s what we had on hand. It added another layer of flavor that both my husband and I loved. Combine frozen blueberries, frozen mango, frozen cherries, and frozen bananas to blender. Add just enough water to blend but not to lose the thick, frosty consistency. Pour blended ingredients into bowl and quickly top with your chosen toppings. Enjoy! I have heard of dragon fruit but never tried it. Next time I see it in the food store, I will give it a second look. We also have a Vitamix and love to make smoothies in it. Thanks for sharing this delicious recipe! 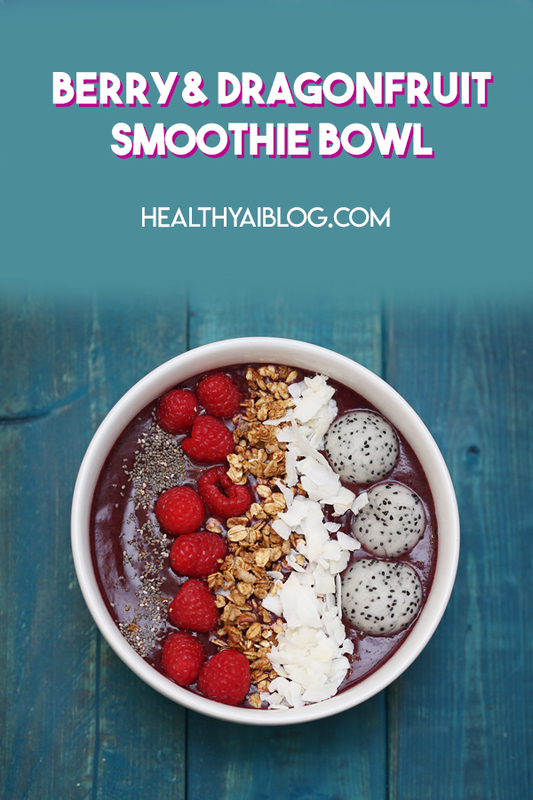 I love smoothies but haven’t tried a smoothie bowl! I’m totally going to try freezing the bananas! 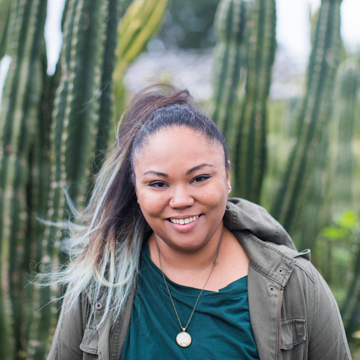 I’m going to venture to a farmers market to look for dragon fruit. I haven’t tried one yet and would love to. 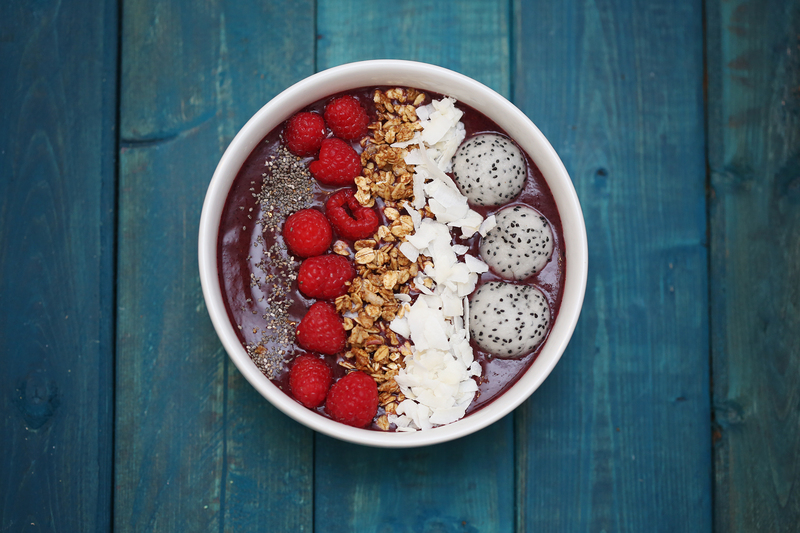 This smoothie bowl looks yummy!